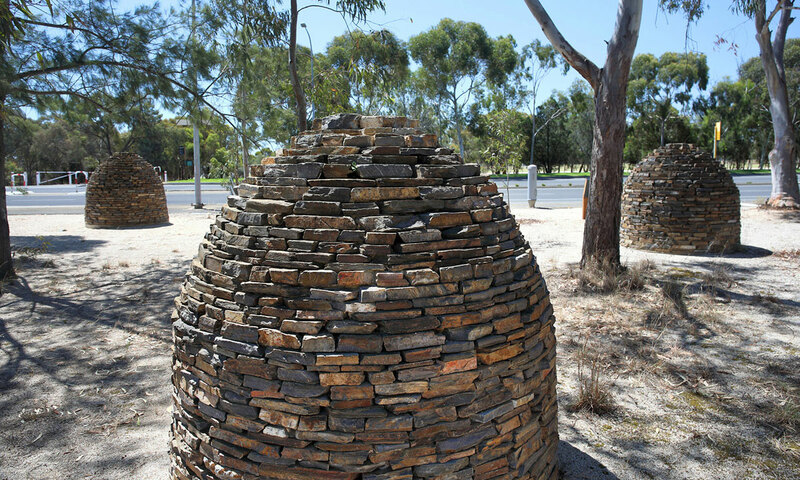 The beehive-shaped stone sculptures in the Parklands beside Sir Donald Bradman Drive are a familiar sight to many Adelaideans. As part of a new series on Adelaide art, Katherine Arguile looks at their origins and inspiration. I first saw the sculptural installation The Lie of the Land 10 years ago, the day we landed in Adelaide. We were full of anticipation for our new migrant life, and as our taxi whisked us from the airport through unfamiliar territory along Sir Donald Bradman Drive, I drank in every sight, feeling the newness of everything after years of living in London. As we approached the city, we glimpsed a cluster of beehive-shaped stone monuments beside the road, constructed in a way that reminded me of the old dry stone walls of the northern English countryside, their shape recalling the 3000-year-old Bronze Age Nuragic stone settlements we once saw in Sardinia. The sculptures had a strange presence, quiet and unmoving sentinels at the city boundary as the traffic rushed past. I’ve driven past them many times since, life too busy to make space to satisfy the curiosity I’d felt. It took the writing of the first of these columns about public art in Adelaide to get me parking in one of the many free bays near the West Terrace junction of Sir Donald Bradman Drive, ready, at last, to take a proper look. They appear small at first, but up close, you see that each conical sculpture is about 1.8m high. There are 11 on the north side of Sir Donald Bradman Drive, beside a cycle path than runs along the edge of Tampawardli (Park 24) and 14 on the south, beside Wirrarninthi (Park 23). They blend in beautifully with their surroundings, sitting on a large bed of gravel planted with gum trees and native shrubs. Thin slabs of local stone are fixed into place with mortar, each piece a different colour: grey, tan, silver, red, green, brown. Some are patterned with snaking red lines; others, powdered with mica, sparkle in the sunshine. The Lie of the Land was commissioned for the Western Gateway Public Art Project by the South Australian Government, with assistance from Adelaide City Council, to celebrate the centenary of Federation in 2001. Adelaide-born artist Aleks Danko and his partner Jude Walton were chosen to create the installation, and they were said to have been inspired by an 1858 drawing by Eugene von Guérard (currently in the National Gallery of Victoria) depicting Indigenous Australians from Lake Bonney and Lake Victoria camped in the Parklands when Adelaide was first settled by Europeans. 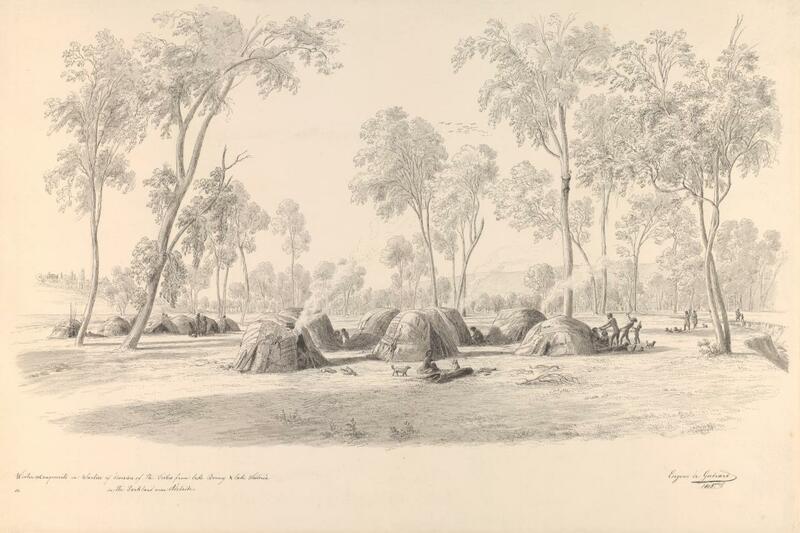 Eugène von Guérard, Winter encampments in wurlies of divisions of the tribes from Lake Bonney and Lake Victoria in the parkland near Adelaide 1858; pen and ink, wash and pencil’; 27.5 x 47.8 cm irreg. (image) 33.5 x 50.0 cm (sheet); National Gallery of Victoria, Melbourne; Felton Bequest, 1960 (644-5). The wurlies in the drawing of the encampment are clearly temporary, and are built lower and squatter than their stone counterparts. Smoke rises from campfires and children play between them. Kaurna elder Uncle Lewis Yerloburka O’Brien, when asked by local artist Perry Snodgrass about the difference between these new stone sculptures and traditional wurlies, said wurlies were usually built of bark, grass, mallee branches and earth, not stone. He added that when the first European settlers arrived, they had set up temporary dwellings in what they called Immigration Square, near what is now Port Road, not far from the site of the installation. They had built, he said, shelters in the same beehive shape, but used traditional Kaurna materials to build them. There is something melancholic about these striking monuments. Unlike a dwelling place, the sculptures are presumably hollow, but completely enclosed, with no doorway. Without an entrance, they can’t be lived in, mirroring Colonel Light’s vision for the city, in which he designated the Parklands as common ground on which no dwellings should be built. More permanent than wurlies, these stone sculptures have become a part of the landscape, placed where they can bear witness to new arrivals to these lands. They are new, yet built from ancient stone. I see them as a reminder of what was lost by traditional custodians of the Kaurna plains, no longer able to set up camp in the Parklands as they once did — and yet the beauty of these sculptures reflects the magnificence of this ancient land, commemorating the fortitude and ingenuity of those that came after, changing the land forever, creating the city of Adelaide. Walking among them, these sculptures feel like the perfect way to mark the centenary of Federation of a country of which I’m now a citizen, in a city I’m glad to call my home. This article is the first in a new InDaily series on public art in Adelaide by Katherine Arguile. Katherine has a BA Hons in Chinese Studies and Art History from Cambridge University, where she was an art critic for Varsity newspaper. She also has a Masters specialising in post-World War II British art from London University’s Courtauld Institute of Art, and a PhD in Creative Writing from the University of Adelaide.